I wonder what Mary thought when she held Jesus in her arms for the first time. Was she afraid of what the world might bring to her boy? Was she ecstatic at the thought of what her boy might bring to the world? She wrapped him in swaddling clothes, laid him in a manger, and ultimately, she gave to the world the best gift she was ever given. Mothers do that. 2014 has been a year to embrace and think about the children in our lives. Last December Bruce suffered a massive heart attack and we came to realize that no matter how old a person is, he is still his mother’s baby, and Gladys almost lost her youngest. A mother never stops worrying. Thirty-four years ago, my Mama watched her nineteen year old baby get married. Until that moment, it had been the two of us against the world. I left her, and didn’t understand her loss. I was supposed to grow up and go away, start my own life. That, I understood. He hugged me tight, shaking his head and patting my back. Then, he moved to Maryland to be with his own true love, Emily, a beautiful girl who brings light, love, and joy to our Ben. We couldn’t have asked for a better partner for our boy. Now, when my nineteen year old Ryan hugs me, I’ve taken to holding onto him a little tighter and a little longer than I used to. Time moves forward, and children grow up. They grow up fast, and then move on to have children of their own. In early February 2015, our Emily will become a mother, and bring to the world her greatest gift, her son, Ben’s son, our grandson. I arranged the nativity set last night as I do every year. With the animals, wise men, and shepherds gathered round, I placed Joseph, then Mary, and finally Jesus in the stable. I took a long time to look at Mary as she looked down at her sweet baby in the manger. I marveled at Mary’s love, a special love, a love that never ends, a mother’s love. We’d like to wish everyone a Merry Christmas, and a Very Happy 2015. There is nothing romantic about cleaning a bathroom. Rusted razor blades hide in the medicine cabinet. Strands of hair stick to porcelain surfaces. The wrappers on band aids in a hinged-top metal box are so old they fall apart with only slight pressure of thumb and index finger. I’m on my knees, cardboard box to my left, trashcan to my right, sorting my father’s medicinal, toiletry, and cleaning supplies. It’s hot in here and the humidity of a June day in Chesapeake is almost unbearable. My limp hair won’t stay put in its rubber band and falls into my face as I reach way back into the cabinet for the last bottle of hydrogen peroxide and a half empty can of shaving cream. I’m trying to salvage what’s left. My dad doesn’t need this stuff anymore. He died on Mother’s Day. We’re all here, minus our parents, my father, their mother, both dead within a year of each other. It’s their house and we feel like interlopers and thieves, deciding which items to take home with us, which to sell, which to donate, which to throw away. Every piece we touch goes into a box, even the objects that have held a place of honor for years. Rooms empty one memento at a time. “I’d like this little pewter clown,” my step-sister calls from the other room. “Put it in your box,” I call. My step-mother collected clowns, had hundreds of them. My father collected frogs. I’d most likely find a small one to place in my box to remember him. The cabinet under the sink is bare. I rise and look at my reflection in the bathroom mirror. Evidently, I am an adult now. I think it happened May 13th. Shaking my head, and looking away, I open the wooden cabinet on the wall above the toilet. My father’s salves, liniments, after shave lotions and razors display themselves in neat colorful order from tallest to shortest. Some are still new in the package and others are waiting for him to return to finish their contents. I open each container, judge its usefulness, its age. I toss his Carmex lip balm and the ever-present tin of Cuticura ointment, underarm deodorant, and a 1960’s safety razor. The last item is a clear bottle with green liquid. I’ve never seen it before. The label is black with a green and gold border. Asian characters above the words JADE EAST are written in a bamboo shaped font. I unscrew the black cap and inhale. I close my eyes and swear my father is standing right there in front of me. It is his scent. I thought I had lost that forever, but here it is in this square glass bottle. I run into the other room and call my step-sisters to me. We pass the bottle around and I watch my own reaction repeat itself with each girl. We take turns dabbing a drop behind our ears, enjoying my dad’s spicy scent. Leslie hands the bottle to me. “You should keep this,” she says. I hold the bottle to my chest. I’d offer it to them, but can’t bring myself to. I want this treasure. I want to be able to open the top and find my dad when I need his presence. I never knew my father wore cologne, never thought about it. I did know his scent though. No other man in my life carried it. 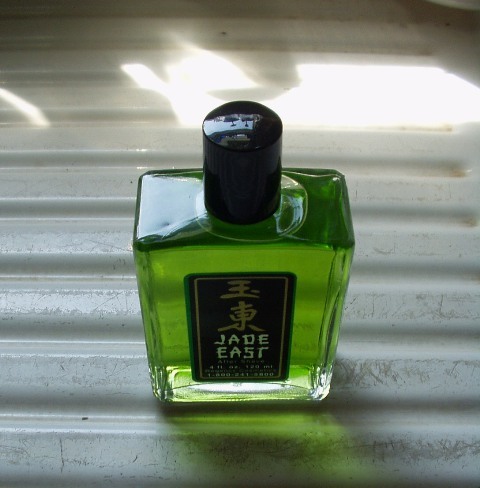 I walk back into the bathroom and place the bottle of Jade East carefully into my cardboard box of keepsakes. I had spent the entire month of December finding volunteers to adopt each of my one hundred thirty nursing home residents. I like each to have a Christmas present to open from Santa. Churches, insurance groups, home companion services, the local University offices, and kind individuals took an elder’s name, bought a gift, wrapped it, and delivered it to the facility the week before Christmas. My skinny Santa rolled his eyes, adjusted his pillows, and hiked up his pants. “Let’s go and get this over with,” he sighed. My boys are good sports, and although Ryan was game, his “Ho, ho, ho” needed a bit more bass and volume. For a first-timer he did alright. It’s a good thing the elders love him, and have watched him grow up. They are patient, kind, and found his presentation, “endearing.” The real Santa never received so many hugs and kisses. By Christmas eve, we were all tired. I anticipated the weekend of Christmas for the days off from work, for a chance to finally put my feet up. My last week of vacation for the year started December 26th; and I was looking forward to some rest. 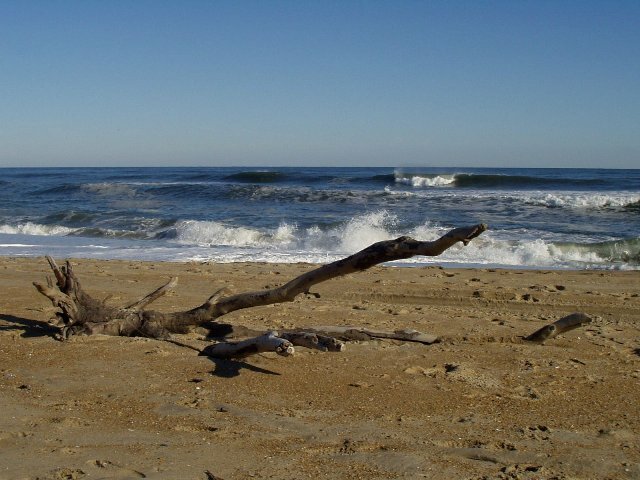 Then, my Mama sprung her gift, a week’s stay ocean-front on the Outer Banks of North Carolina, a four and a half hour drive south of home to the barrier island, a trip, packing, meal planning, driving, family dynamics. She couldn’t contain her excitement as we opened the box to the announcement of her surprise. How do you look a seventy-seven year old smiling grandmother who has outdone herself in what she thinks is the perfect gift and say, “thanks, but what we really wanted was to stay at home.” You don’t. I smiled, hugged her, and spent the next few hours planning the week away. Yes there was a contract, but the extended forecast mentioned expectation of higher than average temps and sunny days. I suppose it’s good to have a handy excuse. He hugged me. “I’ll miss you,” he said. Mama had rented the condo from December 25-January 1. She wanted to make the most of our time and her six hundred dollars. “All we have to do is throw some things into a bag and some food into the cooler and go,” she said smiling, her hands clasped together in her excitement. She wanted to leave that afternoon, on Christmas day. At least no one travels on the twenty-fifth, I thought. Smart people are home, gathered around the tree, opening presents, or sitting down to a home-cooked meal, Norman Rockwell style. Most people. Traffic was horrendous. I envisioned clear roads, uncongested tunnels, clean rest stops. Wrong. It seems everyone travels on Christmas day and there’s no place to stop for a bite to eat except the Lucky Mart, ten miles off the interstate. They had stale ham and cheese sandwiches, cold tofu burgers with processed cheese to heat in the microwave, chips and drinks. 5th Avenue candy bars served as our holiday dessert. It was cold at the beach, and there’s not much to do in the winter time. The second floor condo Mama had rented was nice, with a wrap-around couch, large flat screen television, state of the art stereo system, and ample pots for cooking. The sliding glass doors opened off the living area to a balcony. We each had a bedroom to hole up in when needed and mine faced the ocean. If I cracked the window a few inches and burrowed under the covers at night, I could listen to the waves breaking on shore. Mama brought her dominos, a double set of playing cards, and her recipe book. 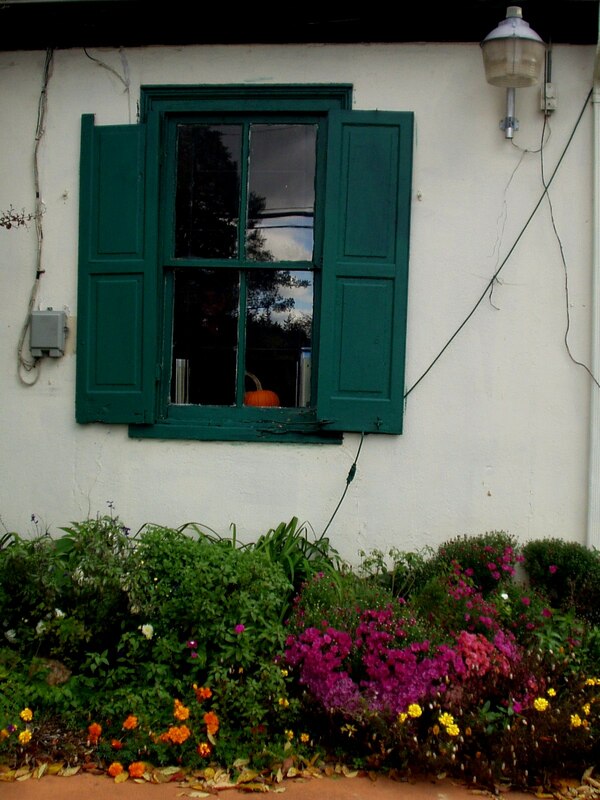 She fixed coffee for us each morning with just enough sugar and a French vanilla creamer that made me close my eyes and breathe in deeply over the cup, savoring the aroma before letting the sweet caffeine slide down my throat. She always knew how to make a good cup of coffee. I slept in Monday morning and lounged in my pajamas all day, like I’d wanted to do the day before. I took out the book I’d gotten for Christmas, Suttree by Cormac McCarthy, and read, realizing I didn’t have laundry to wash, wrapping paper to clean up, or a tree to dismantle. I enjoyed a big bowl of Mama’s homemade potato soup with little round oyster crackers. I wrapped myself in a blanket, tucked my feet under me, and read the rest of the evening. Tuesday was just as quiet with the exception of a rousing game of Spite and Malice, which my mother won. She’s the competitive one. We spent the whole of Wednesday ferreting out the thrift stores in the area, trying on vintage comfortable clothes and eclectic jewelry that we’d only pay a dollar a piece for. Mama picked up a green plaid duvet cover for my bed at home for two dollars and I found her a whole box of canning jars with lids for a dollar and a half. We tried on silly purple hats with veils and almost wet ourselves laughing over a pair of shiny red leather, six inch stiletto heels. “I think I’ll buy these for Mary Elizabeth’s next gathering,” Mama said holding the shoes by their spikes. I opened my eyes wide. Mary-Elizabeth is one of Mama’s church friends. She holds fancy teas and respectable luncheons. Her gloves are white and she dons a lace apron when serving refreshments. Mama showing up in stilettos would cause Mary-Elizabeth to go pale, maybe faint, and attempt to hide my mother from her other, more staid friends. Mama would smile, twirl and dare Mary Elizabeth and her friends to walk a mile in her shoes. I held the strappy little numbers by their leather backs and dared Mama to try them on. She never backs down from a challenge. She sat on a wobbly wooden rocker in the thrift store and slipped off her soft loafers. I felt a bit like her prince charming, down on my knees, buckling the shoes onto her feet. I held the hand of my seventy-seven year old mother as she stood and teetered toward the full length mirror. Her elastic waist jeans and flannel button-down shirt gave her that very aged “Ellie May gone inner-city girl” appearance. She struck a pose with hip stuck out, hand behind head, and the two of us doubled over laughing. I had to hold onto her to keep her from toppling head first into a rack of vintage beaded evening gowns. The week came to a close much too soon. I hadn’t laughed so hard, eaten so well, or rested as much in a long time. On Friday afternoon, the day before we left for home, we were drawn to the window by the sight of a hundred or more gulls and pelicans circling and diving into the water after a school of fish so large and boisterous the ocean couldn’t contain them as they fought for room to swim. The fish seemed to jump up out of the water to meet the mouths of the birds. In all of our years of coming to the Outer Banks, my mother and I had never seen so many sea birds congregate over the ocean, settle on its surface, or dive in such a frenzy. They looked to have been shot from the sky, beaks pointed down, spiraling into the water with a splash, only to come up again, bobbing on the surface. Then they rose again to the air and repeated the exercise. Both of us were speechless. We stood in awe of the hundreds of white winged dots rising, falling, dipping and splashing. Then a movement caught my eye and I pointed in its direction. A blue-black hump rose just above the surface of the ocean and shone bright as the sun glinted off it. I thought it was a dolphin at first, but hadn’t seen a fin. Then the hump disappeared and was gone, but a few seconds later a large spray of water erupted from the ocean’s surface and several feet behind it, a fluke lifted. It was a whale. I had heard others speak of the migration of the humpbacks in December, but I’d never seen one. We stood watching them for the next hour. Every once in awhile, a back emerged, or a fin lifted and hovered parallel to the water, then slipped under again. They swam and spouted and waved at us as we stood side by side, watching in wonder at my mother’s ultimate Christmas gift. Nursing homes never close. Weekends and holidays are included in the work schedule. The most popular holidays to have off are Christmas and Thanksgiving. New Year’s Day is special to those who party the night before. I worked Thanksgiving last year. It was my turn. We planned our meal at home around my absence. I was annoyed. Holidays are family time and I hate missing my routine, watching the Macy’s Thanksgiving Day Parade in my flannel pajamas and fuzzy slippers, spending most of the day in the kitchen, basting the turkey, mixing batter for pumpkin bars, smacking the boys’ hands as they dip a finger for a taste, peeling ten pounds of potatoes, listening to Johnny Mathis croon Christmas tunes, and later, after the feast and dishes, football games. Next year, I thought with a sigh. Oh well, I reasoned, go in early, leave early, dinner with in-laws by four o’clock, help with dishes at their house, and finally football at home. The day won’t be a total wash, but not what I love. I hit the time clock by the nursing home kitchen door at seven twenty-six, making Thanksgiving a work day. Most every room’s television displayed marching bands, floats with popular singers, and giant helium balloons coming around the corner onto Sixth Avenue from Broadway in New York City. Mary and I watched Kermit the Frog wave to the crowd. Down the hall and around the corner Olive and I laughed at Ronald McDonald as he looked to be running to catch up to his fellow helium-filled buddies. I sat on Earl’s bed while we watched a marching band move into formations while keeping tune. Earl kept time with his right foot tapping on the linoleum floor tile. I dropped by the kitchen to see how the holiday dinner was coming along. Three, golden brown twenty pound turkeys lay side by side in baking pans, Raymond, the chef, kept an eye on the candied yams, green bean casserole, oyster dressing, and glazed carrots. He was chopping cranberries for the relish and had a pot boiling on the stove for ‘real’ mashed potatoes. Yeast rolls rose in the warming tray and gravy bubbled in a pot. Twenty-five homemade pies cooled on the rack. In my thirty years, I’d never seen such a feast. I smiled with anticipation for the elders and went back upstairs to transcribe the list of “things we’re thankful for” residents had turned in the week before. Robert, the maintenance assistant walked into the Activity Room for his break, and put on a pot of coffee. He was working Thanksgiving day too. As the smell of brewed coffee filled the room, Robert pulled up Tractor.com on the computer and drooled over several John Deere four-wheel drive machines with enclosed cabs. Robert’s a farmer at heart, keeping up with a small cattle farm single-handedly in addition to his forty hour work week at the nursing home. The elders love Robert. They’ve adopted him as their son. His daily rounds include a tool box filled with wrenches, hammers, hugs, cups of coffee, and often, just five minutes of time to listen to stories. “What are you doing at noon?” I asked him. We searched the cabinets and finally came up with a fairly large, straight edged knife. “Can’t cut hot butter with this thing,” Robert said, running his thumb across the dull edge. “Let me go find a file.” Suddenly, he was in his element, finding an implement he could sharpen, like a blade on his hay mowing machine. Robert carved, and the rest of the staff members served the feast. The large, flat screen television over the fireplace is perfect for football. Dallas and New Orleans faced off and old men stared intently at the action. One shook his fist at an Umpire’s call. Several cheered when their team scored, and a few on the losing side cursed. It was just like home, only with wheelchairs. We unfolded strip after strip of paper, transcribed with so many blessings in shaky handwriting, by nursing home residents who still felt thankful. “You write one,” Constance said to me. Spending Thanksgiving Day with my Friends here. Usually, when corporate executives visit the nursing home, the experience raises everyone’s blood pressure. Their expectations seem so unrealistic. After all, they sit in some office somewhere and make policy. We are busy taking care of basic needs and attempting to add a little light into old, frail lives. This week, the biggest of the corporate folks arrived in force. The company has re-organized due to cuts in the Medicare program. The new directors are moving across country, visiting all the homes, offering assistance, best practices they’ve seen on their travels. They’re asking us questions. They’re encouraging us to share our best practices with them. They’re listening. Our blood pressure has leveled off, maybe even decreased. Prior to their visit, sometime over the weekend, someone dropped off a bushel of apples from a local orchard. They were on my doorstep at work Monday morning. I was excited. Here was an unlimited variety of meaningful activity for my elders, a week’s worth of fun, pies, apple butter, applesauce, dried apples, sliced raw apples, juice running off whiskered chins, wrinkled hands peeling, shared recipes, stories of orchards, harvests, and senses enhanced by cinnamon, nutmeg, allspice and real butter. Something stopped me from getting rid of them. I left the basket of apples on the counter. When staff asked about them, I said I had a plan for them. I wasn’t sure what it was yet, but I knew there was one. The corporate wheels rolled into the parking lot at varying times on Tuesday afternoon. They converged in the conference room as our staff whispered, and wondered, and wrung their hands in anticipation. The surface of the place shined, the halls smelled of aerosol orange essence. There were a whole lot of us, so we met in the activity room. It’s the place where residents feel most at home. There’s a green Formica-top kitchen table with chrome legs, a distressed white-washed kitchen cabinet housing mixing bowls, spices, a flour sifter, a Rumford baking powder cookbook and a china tea set. Against one wall, a wooden workbench sits under a pegboard with tools attached, a hammer, wrench, oil can, spark plug, fan belt, garden hose sprayer, carpenter’s level and a screwdriver. The piano sits against the other wall with music books. Spider plants and terrariums enjoy the sun from stands in front of the windows. A couch, love seat, and glider rocker sit in a group encouraging rest or reading of the books and magazines on the shelves. It’s a place I’d want to go to find refuge if I lived in the nursing home. The VP had us sit in a circle. He introduced himself and asked each of us to do the same and tell everyone how long we’ve worked here. There are five of us who have been working here over thirty years. We are considered the elders of the staff. The VP was in awe of our longevity. He shouldn’t have been. It’s what we do, it’s who we are. These elders are our hearts. When the meeting disbanded, when we understood the goal, the company director of dining services walked over to my basket of apples. “You planning some apple activities this week?” she asked. “And you changed your mind?” she asked. “They’re not FDA approved,” I said. “Let’s see,” she said taking one from the basket, washing it thoroughly with soap and water and biting into it. “Seem like perfectly good Granny Smith apples to me, great for cooking and eating. They’d make wonderful pies. Just wash them well,” she said, turning toward the door. Celia and I peeled a colander full of the crisp green apples this afternoon. She had her own knife, the one she keeps locked in my desk drawer. We tried to outdo each other in making the longest spiral of peel. She beat me hands down. I cored and sliced the juicy quarters into one-eighth inch slivers. Betty gave up her mother’s apple pie recipe. It took very little coaxing and brought a warm smile to her face. Robert, a former chef, explained the difference between nutmeg and cinnamon and how much to sprinkle over the pie because Betty’s mother didn’t measure, she just sprinkled. Elise, whose fingers don’t work like they used to, sugared the apples, and Tessa fussed over the crust. Laura, who has difficulty finding the words for her sentences, read each step of the recipe with her glasses perched on the end of her nose. And Sonny, who’d never baked anything in his life, measured out the butter because he didn’t think it was fair to eat a piece of the pie if he didn’t do something to help. 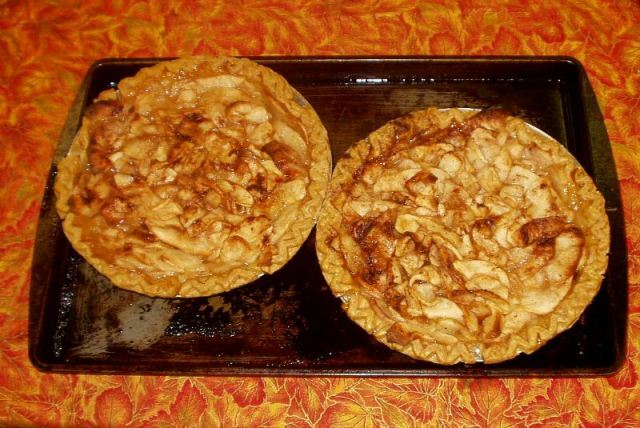 With the oven preheated to 350, two apple pies slid inside and onto its metal rack. We waited the hour of baking, telling more stories of pies from the past, of other mother’s recipes, of days in kitchens from years ago. The scent of cinnamon and nutmeg, butter and sugar filled the room and drifted out into the hallway. Staff members drifted back to us to see what smelled so good. They wanted us to start a bakery. They complimented the group on a job well done. The only thing better than warm apple pie topped with vanilla ice cream is the feeling of accomplishment in making the pastries from scratch. If you don’t believe it, just ask Celia, Betty, Robert, Elise, Tessa, Ethel, Laura and Sonny. The tiny deer tick (Ixodes scapularis). I never thought much about the insect. It was a pest, something to search for on my body after a hike in the woods or tall grass. Sometimes it was stuck tight to my skin and needed to be extracted with a pair of tweezers and some alcohol. The nuisance, pinched between my index finger and thumb was then flushed down the commode in the bathroom. Recently I discovered that the tick is actually an arachnid. I should have cringed at the significance of this information. I hate spiders. Now I hate ticks. I’d heard of Lyme disease and Rocky Mountain Spotted Fever. These maladies have symptoms to look for like a bull’s eye around the bite, muscle or joint pain, fever, chills, fatigue and headache. Never in my life did I think a tick bite would lead to an allergy to one of my favorite foods. Four years ago I was out of town at a baseball tournament with my eldest son. After one of his games, we went to a nationally known steakhouse for dinner. Ben ordered a huge steak for himself, and his grandmother and I split a meal. After midnight, I woke with stomach cramps, walked into the bathroom of the hotel, and fainted behind a locked door. My mother heard me fall, banged on the door until I regained consciousness and then she coaxed me to open the door. I had severe nausea and vomiting. We thought it might be food poisoning at first, but she was not ill. We had eaten the same foods. We then assumed I had been hit by some sort of bug. Little did I know. Three months later, my youngest son and I went to a local Mexican restaurant before attending a little league game. Ryan ordered a burrito while I chose the taco meal. At eleven o’clock that same evening, I fainted in the hallway outside my bedroom. Ryan heard the fall and came to investigate the noise. He found me, having regained consciousness, but vomiting violently. I went to the doctor the next day and he seemed to think that I had a case of food poisoning. The third instance occurred after eating out at one of our favorite local burger joints. I began to suspect that I was ingesting some type of spice or additive that restaurants use to season food. Each time the fainting and vomiting occurred I had eaten out. I contacted each restaurant to obtain a list of the ingredients in the recipes of the meals I’d had. My doctor considered low blood pressure, a heart condition, and after those tests proved me to be within normal ranges, he sent me to an allergist. They took blood and did skin tests. The skin test showed a mild allergic reaction to hay, grass, dust and cat dander. The blood test gave me the answer I was looking for. The doctor confirmed it was indeed a beef allergy, and I best not eat any more of it. How could I be allergic to beef? I’d eaten beef my whole life. It had to be something else, and furthermore, the symptoms didn’t occur every time I ate beef. I could count three other times that week that I’d had beef and didn’t faint or vomit. The instances of symptoms were coming more frequently though, and when they did happen, they were also more severe. It still didn’t feel life threatening to me. Then on a Tuesday evening, after a delicious dinner at our favorite family style restaurant, I stopped breathing. I was getting ready for bed when the phone rang. I had a nice conversation with my aunt and as I went to hang up the phone, I felt a bit light headed. I remember thinking; I need to call for Bruce, my husband, because I felt really strange. When I came to, members of the volunteer rescue squad were huddled around me as I heaved violently. My body itched from the top of my head to the bottoms of my feet. Hives covered me. Bruce had found me in the kitchen chair, not breathing. Ryan called 911 while my husband followed the dispatcher’s instructions to get me breathing again. The ambulance crew arrived and administered the antidote. I spent the night in the emergency room. I had eaten potatoes that had been fried on the same grill as beef. The juices from the beef mingled with the potatoes and four hours later, my body reacted. The allergy was no longer a silly inconvenience. I now understood the significance of the beef allergy, but had no idea how I had developed it after years of eating beef with no problem at all. One day I received a phone call from a friend. She had heard a story on National Public Radio about a study that was being conducted at the University of Virginia concerning people developing beef allergies from the bite of a tick. I pulled the story up on the computer and found that I presented with every symptom listed. I had found my answer. Doctors believe that there is a bacteria in the tick’s saliva that causes the body to react to the sugars in beef as allergens. Some people develop allergies to pork, lamb and other mammals as well as to beef. What is unusual about this allergy is that the reaction occurs four to six hours after the ingestion of the beef, when the sugar from the beef reaches the bloodstream. Because the reaction is not immediate as with other allergies, people don’t associate the response with eating the meat. This allergy is becoming more prevalent in regions where deer and deer ticks are common. The study is still being conducted by the University of Virginia.